The Arbeau Dancers are a group based in West Yorkshire who perform dances from the fifteenth through to the nineteenth centuries. The group formed in 1974 when two friends were asked to demonstrate some dances at a concert. Since then we have had several changes and at present can call on over a dozen dancers. You can see an interview with Arbeau here. 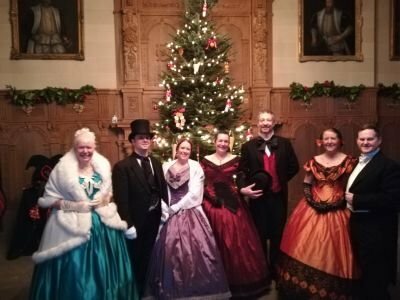 We practice Saturday mornings at Temple Newsam in Leeds and are looking to recruit new dancers to join us and enjoy learning historical dances and dressing to impress in lovely historical settings, if you're interested please contact us via facebook or email to find out when we're next practising. We've finished for 2018 but will be starting our practice again on 12th January 2019 at Temple Newsam.